Who says smoothie bowls are only for grown-ups? My son has been asking for bigger and better after school snacks when he gets home from school. He says an apple or orange just won't fly … you know how growing tweens can be … He loves smoothies but I wanted to try something a little bit different for his after school snack: a kids smoothie bowl recipe! A smoothie bowl is just as easy to make as a smoothie, especially if you use Dole Frozen Fruit or Dole Fruit & Veggie Blends. Plus a smoothie bowl feels more substantial and filling than a smoothie drink alone. 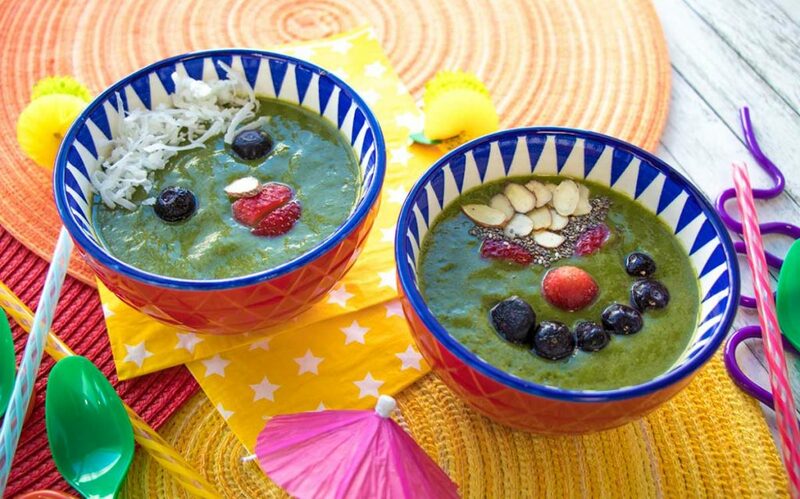 Like adult smoothie bowls, you can even decorate them with kid friendly designs. We decided to make faces on the smoothie bowls using frozen fruit, sliced almonds, and shredded coconut. 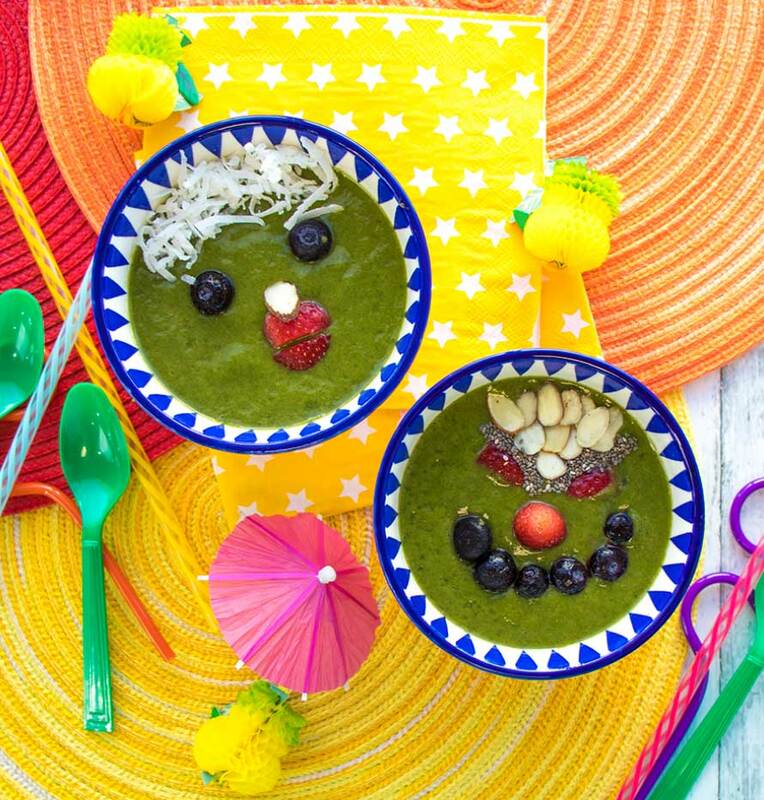 The kids will have so much fun decorating, they won't even realize this smoothie bowl is filled with veggies too, thanks to Dole Fruit & Veggie Blends. My husband has been using Dole Fruit & Veggie Blends to make breakfast smoothies for himself every morning, adding a banana, coconut water, and sometimes fresh mango to the mix along with a scoop of protein powder. 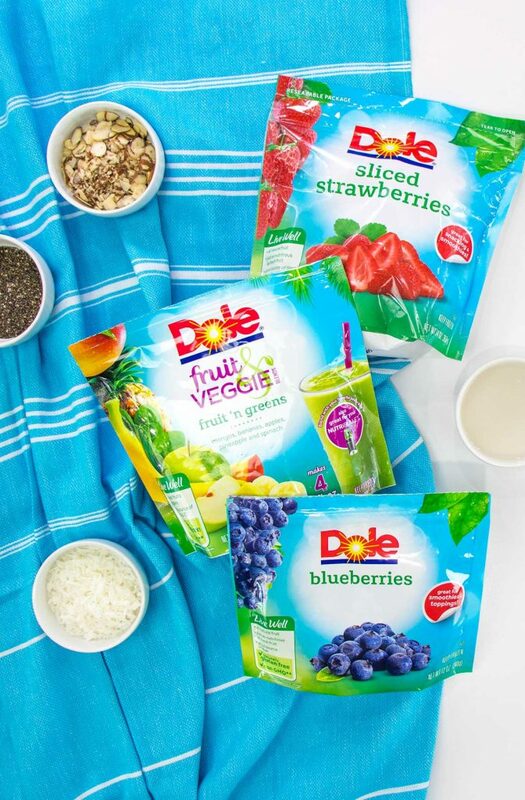 We always have a bag of Dole Fruit & Veggie Blends in our freezer … it makes sense to use the same blend to make our after school snack smoothie bowls too! We made these smoothie bowls in small dip bowls so that they would be a nice, easy snack for any time of day. You can double the recipe to make a larger smoothie bowl for a meal. This recipe makes one small smoothie bowl, perfect for a small afternoon snack. You can also make extra smoothie mix and freeze in frozen ice pop molds to make your own homemade ice pops. Watch the video above to see how to make these fun smoothie bowls that the kids will love. And keep reading to grab the printable version of this kids smoothie bowl recipe. 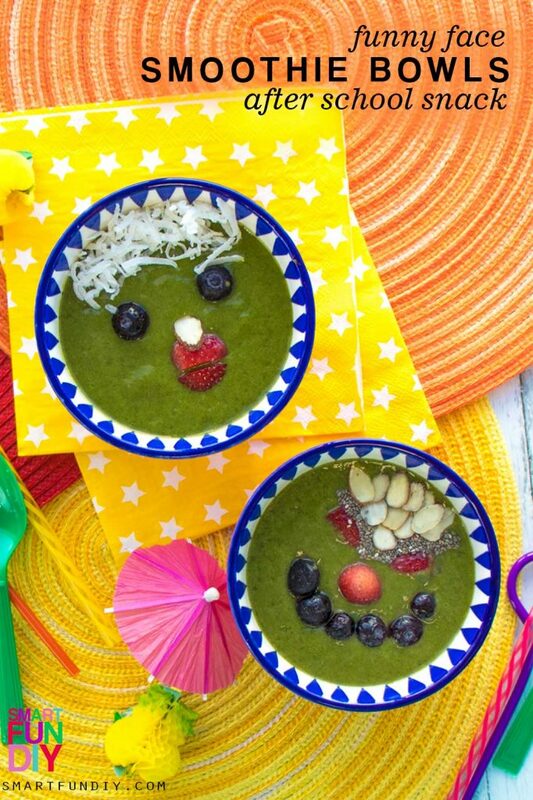 Silly face smoothie bowls the kids will love. Blend Dole Fruit & Veggie Blends Fruit ‘n Greens, peeled banana, and coconut water in blender on the smoothie setting until smooth. Cut frozen strawberries and blueberries to make faces on the top of the smoothie bowls. Further embellish the faces with the sliced almonds, chia seeds, and shredded coconut. 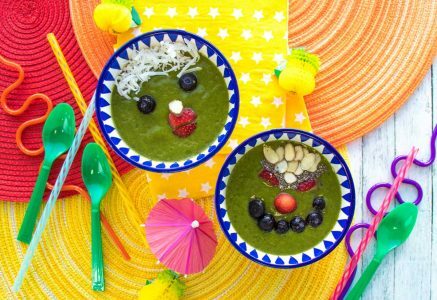 Depending on your kids' tastes, you can add chia seeds, sliced fresh fruit, and fresh flowers to further decorate the smoothie bowls with funny faces. Make a grown-up version of the same smoothie bowl by arranging the decorative ingredients on top of the smoothie bowl in a pretty pattern. 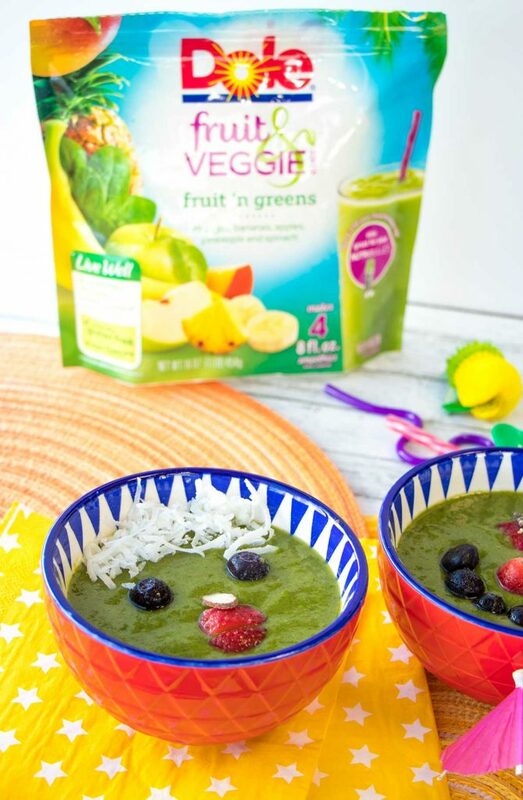 Which Dole Fruit & Veggie Blends will you use to make this hidden veggie kids smoothie bowl recipe for your family? I'd love to hear about your experience with smoothie bowls and what your kids think about them. Please share in the comments.